What does FBI agent Kelly Cameron’s college sweetheart, the dashing Xiang Shen, have to do with her latest case? As Cameron digs deeper into China’s influence on the presidential race, Shen’s romantic overtures might not be quite what they seem. What does this Chinese diplomat have to do with the influence of a foreign power on a national election? And who is targeting Cameron and her daughter? 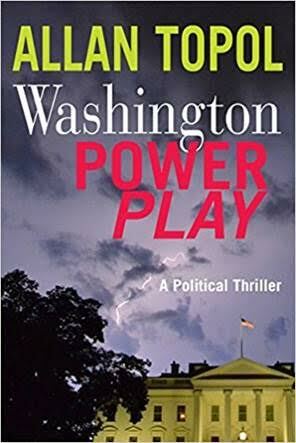 In Allan Topol’s inimitable style, WASHINGTON POWER PLAY spins a tale of international intrigue, deception, and corruption at the highest levels of power. Kelly Cameron has just thwarted a terrorist attack on the Walter Reed Medical Center in Washington, and is now in charge of a task force to find a mole in the U.S. government. She soon finds evidence of a plot initiated by the Chinese government supporting General Darrell Cartwright to promote his election as the president of the United States. Cameron’s efforts to thwart this plan are hindered by Shen, and Andrew Martin, a powerful Washington lawyer who has strong ties to the Chinese. At stake in this Washington power play is nothing less than the global balance of power. Allan Topol WASHINGTON POWER PLAY is Topol’s 13th novel of international intrigue. Two of them, SPY DANCE and ENEMY MY ENEMY, were national best sellers. His novels have been translated into Japanese, Portuguese and Hebrew. One was optioned and three are in development for movies. More recently, many of his books focused on his Craig Page series, including THE ARGENTINE TRIANGLE, THE RUSSIAN ENDGAME, SPANISH REVENGE, CHINA GAMBIT and ITALIAN DIVIDE. In addition to his fiction writing, Allan Topol co-authored a two-volume legal treatise entitled SUPERFUND LAW AND PROCEDURE. A graduate of Yale University Law School, he is a partner in a major Washington law firm, and has traveled extensively researching locations for his novels. He wrote a weekly column for Military.com and has published articles in numerous periodicals including the New York Times, Washington Post, and Yale Law Journal. He also has blogged for Huffington Post. For more information, visit www.allantopol.com. 1. How is WASHINGTON POWER PLAY timely in today's political world? Washington Power Play deals with an effort by the Chinese government to influence a US presidential election. Right now, no topic could be more timely than a foreign government's attempt to influence a US presidential election. The lead story in the media day after day is whether Russia influenced the election of President Trump. Two years ago when I wrote Washington Power Play, dealing with China's effort to control the election of the US president, I had no idea that my book, when published, would be so timely. 2. How did you decide to write about a plot initiated by a foreign government to support a candidate for President of the United States? I am and have been an attorney in Washington and a partner in one of the most influential law firms in this city. Though I have never held a position in government, I have been on the fringe of our nation's political process. In this position, I have observed how vulnerable our presidential election process is to outside manipulation by those with large amounts of money who want to elect a president who will support their agenda. Starting with this fact, it was a relatively small leap to ask what if the Chinese government wanted to manipulate the election to put someone in the White House who would support their agenda. That is the premise of Washington Power Play. 3. Does it mirror what is being discussed about Russia today and President Trump? Washington Power Play goes one step beyond what is being discussed about President Trump and Russia in the media. In Washington Power Play, the foreign government involved, namely China, has selected the individual, General Cartwright, an American military hero, who they would like to be US president , encouraged him to run, and arranged financing for his campaign. Cartwright, a complex character, does not view himself as a traitor. Rather, he is convinced that he is advancing an agenda in co-ordination with the Chinese which he believes is in the best interests of the US. 4. Why did you choose to write about China? As the twenty first century is evolving, China has emerged as the primary rival of the United States economically, militarily, and diplomatically. The Economist wrote on April 1, 2017, that China is challenging the US for the world leadership it has exercised since the end of World War II. In this effort the Chinese have launched wide ranging spy efforts in the United States. Two examples were uncovered recently. One involved a high level career official with the State Department who accepted cash and gifts for many years to pass classified US political and economic information to the Chinese. The other involved an American energy engineer procuring nuclear know how for the Chinese. These are only two examples of real life Chinese espionage in the US which is a critical part of Washington Power Play. 5. How do you research topics for your book? I read a great deal about history and geopolitical events throughout the world. I also travel to foreign locations to obtain background for my novels. I have been to China, France, Israel, Italy, Spain, Argentina, and Japan, among other countries researching my novels. Also, the internet is a wonderful source of information that enhances research. For Washington Power Play, I not only visited China, but immersed myself in China political, military and strategic matters both in books and on the internet. I spoke with people possessing China expertise. In addition I read biographies of Chinese leaders such as Deng and Mao to understand what was motivating them as they led the Chinese effort to surpass the US. 6. What is your background in understanding power in the Beltway? For more than thirty years I have been a partner in one of Washington's most influential law firms. In my work, I have argued in the Supreme Court and many lower courts. I have dealt with numerous governmental agencies. I have spent time and worked with individuals holding positions at the highest levels of the US government and some foreign governments as well as those in the media. From this close contact and involvement, I have observed the exercise of power inside the Beltway. I have watched the unfolding of the never ending crises, including in fighting, struggles for power, the pursuit of personal agendas, corruption, and sexual scandals that grip Washington in every Administration. All of this was very helpful in writing Washington Power Play. 7. What motivates you to write as this is now your thirteenth book of international intrigue? I write novels because I care deeply about geopolitical affairs. Fiction is a very effective vehicle to convey ideas about geopolitical issues. My goal is to entertain readers with page turning suspenseful novels, with strong characters, male and female, like Kelly Cameron, the protagonist of Washington Power Play. At the same time I want to educate readers, not with characters who lecture but with the unfolding story. 8. What's the best advice you received about writing that you still use? The best advice is: make your novel a page turner, make your readers want to know what happens next, and create compelling characters. To achieve this, I recommend that you start with a three sentence synopsis of your story. Then prepare a detailed outline, scene by scene. Mine are typically 40 or 50 pages. When you write, you may not follow this outline precisely, but it is critical to have the blueprint. You would not build a house without detailed plans. Once you have the outline, prepare profiles of your three or four main characters, what they look like, their backgrounds, personalities, and strengths and weaknesses. Make them compelling. You must get to know them yourself. When you have done all of these things, you can begin to write. Also write your first draft in a white heat---straight through to the end. Do not revise until you have completed the first draft. 9. How did you choose your characters names? For the names of the Chinese characters in Washington Power Play, when I was at the Aspen Music Festival, I studied the names of the Chinese musicians in the programs for various events. For foreign names, I use history books about the country as a source. More generally, I try to pick names which seem to me like the characters they represent. Occasionally, I use the name of someone I know. For example, in Spy Dance, I used Sagit for the name of my main Israeli intelligence agent. Sagit was the name of a good friend of my daughter in school; her father had been a military hero. 10. Any more books on the horizon? Where will it take place? My next, fourteenth novel, will again feature Craig Page and Elizabeth Crowder as the protagonists. They were the lead characters in five of my prior novels but did not appear in Washington Power Play. That next novel will be focused on Hungary and much of the book will take place in Budapest which I visited last fall. Part of the action will also take place in Paris, Tel Aviv, Moscow, and Washington. After that, I am developing a story that revolves around Iran.